Our Promise to insure Quality! Premium Select ™ -- Assuring the Highest Quality! Careful Selection - Only the best makes and models are selected to insure the best value. An extensive inspection is performed to insure that each instrument meets our stringent standards of both quality and value before acquiring it. Due to the high cost of true rebuilding (custom re-manufacturing) to make a piano last for another 50- 75 years, most rebuilders perform a lesser expensive commercial rebuild that generally does not hold up or retain its value. Low Wear - Every piano is selected to have less than 5% if not 1% wear to insure your piano will be LIKE NEW. By selecting pianos that have such low wear, we assure you will receive a piano that will last a lifetime as your family heirloom. Quality - To ensure our exacting standard of quality, we only select 4 out of 100 pianos! 94% of pianos do not meet our criteria due to either having too much wear or need too many replacement parts. Price - Each piano must be acquired at the correct price to provide the best value and lowest cost of ownership. Because we sell pianos that are 50-80% less than comparable new pianos, each piano must be acquired to allow for the investment of our extensive refurbishing. Refurbishing/Reconditioning - Each piano receives a complete overhaul and is brought to Concert Standard. To cut costs, most new pianos are delivered to minimally meet manufacturer specifications. We disassemble every piano, inspect and correct any flaws, then reassemble with careful precision to ensure concert standard performance. When finished, each piano plays with as much performance and tone as a model two to three sizes larger. Marketing/Selling - We will make no false claims about the piano, its background, its condition and durability. We are dedicated to providing you with the knowledge that you have purchased the perfect instrument to hand down as a family heirloom. It is imperative that you understand everything about the value of the piano you are purchasing. As a concerned piano buyer, there are no stupid questions ...ever! 5-Year Warranty - Our 5-year warranty insures your peace of mind should any issue develop. We insist on 110% customer satisfaction and stand behind our products unlike others in the industry. 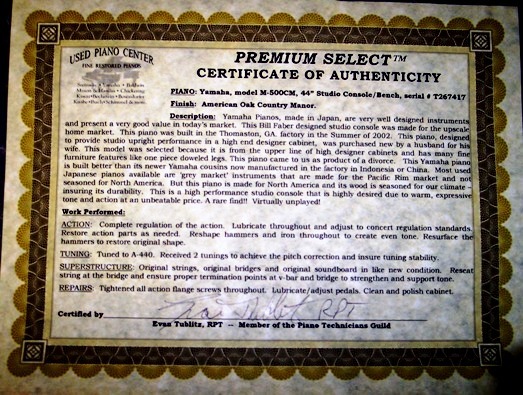 Certificate of Authenticity -- Each piano comes with a Certificate of Authenticity for your records. This certificate contains information about the manufacturer, age of the piano and any history of its previous owners. It also includes a detailed listing of all work performed by us on the instrument and is signed by Evan Tublitz personally to authenticate its contents. Lifetime Full Value Trade-In Policy - Full purchase price is applied to the LOWEST selling price of the upgrade! Unlike most stores, we do not apply the purchase price to MSRP retail price or any inflated price but to the lowest selling price for your upgrade piano. You can be assured to pay the lowest price for the upgrade. Through careful selection, refurbishing and expert craftsmanship, our aim is to create a magnificent piano that is unsurpassed in quality, performance and value. Our ultimate goal is to ensure that you and your family enjoy and treasure a beautiful instrument for generations to come.